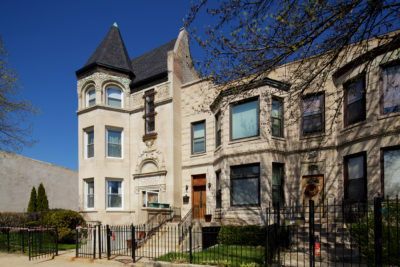 On 63rd near Spaulding in the Chicago Lawn neighborhood, 73 years of photography history came to a close with passing of Joseph Herbert, aged 93. Herbert ran Marquette Photo Supply, a small camera shop that stayed in business as most others closed in the face of digital photography, online sales, and the emergence of cell phone photography. I first discovered Marquette Photo Supply a few years ago on a chilly Saturday afternoon while walking down 63rd Street. The neon sign advertising Kodak cameras was intriguing, but learning that Marquette Photo Supply was open for business was far more exciting. Inside was Joe Herbert, a man in his early 90s running the store. During my first visit he gave me a tour of the adjacent barber shop which was run by his father Peter Herbert. Over the next few years I stopped by to chat about the neighborhood, the city, and how the emergence of various technologies over the years impacted photography. Joe didn’t mind people coming in just to take pictures without buying anything, but on several occasions I bought something anyway. Sometimes it was for something I needed, sometimes not. More than once he’d tell me to have a seat while we shared stories, once with The Price is Right audible in the background. Visits sometimes felt like a visit with an elder grandfather combined with local history lessons. On some occasions he seemed eager to talk and have company, and others ambivalent about carrying on conversation. In searching through old newspapers looking for artifacts of Marquette Photo Supply, I found a few advertisements from the late 60s/early 70s and printed them out. Wondering if Joe would find them interesting, I headed down to his shop with the printouts in June of last year. Upon arrival I saw a small handwritten sign indicating the store had closed, with a phone number. I called the number immediately, but no answer. Eventually the number went straight to a full voicemail box, and later visits to the store had no news on the health and well being of Mr. Herbert. An obituary in the Sun-Times in September of last year confirmed my fear–Joe Herbert, 93, had passed away. The loss of Mr. Herbert also marks the end of Marquette Photo Supply, one of a precious few remaining camera shops in the city. Joe’s parents were Hungarian immigrants and his father Peter was a barber. 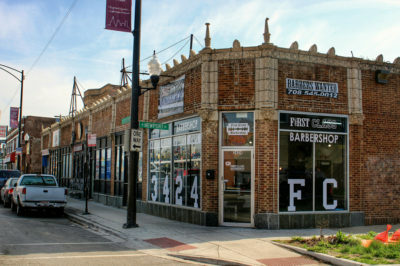 The business, Herbert’s Barber Shop, was located at 3312 W 63rd and the family lived in an apartment behind the business. According to Joe, his brother Peter M. (son of Peter H.) earned the rank of Lt. Colonel in the army, and after service returned to the family business as a barber. A newspaper clipping on the wall highlights recognition for the barber shop’s 50th anniversary, though it was likely in business for longer. In addition to various awards and press clippings, several family photos are throughout the barber shop, including a young Joe Herbert (above). Photography was his business as well as something he enjoyed from an early age. One story he shared involved taking along a camera during a childhood trip to visit family in Hungary during the lead up to the Second World War. When he surreptitiously revealed his camera to take photos of a military parade, soldiers of Hitler’s army ordered him first in German and then in English to put the camera away and not to take photos. He worked a number of jobs during and after high school, including a stint as a pin setter at a bowling alley across from the family business. In 1944 he opened Marquette Photo Supply, in a small storefront east of the family barber shop (above). Using money made from the business, Joe bought a vacant lot on the other side of the barber shop at 3314 W. 63rd. After paying off the loan for the land, he used the land as collateral for a construction loan. He hired an architect to design a bold and eye-catching store in the Googie architectural style, with sharp and sweeping angular lines. Some of the shelves contained electronics items from decades past, still with the original asking price. In many cases the new MSRP was in line with the asking price for the same items on eBay in original packaging. As years became decades, Marquette Photo Supply adapted to new technology and products, though always focusing on cameras. In discussions of successive waves of technological advances in photography, Joe spoke positively about changes that transformed photography into something everyone can do. He said that digital cameras and home printing were particularly nice, as you no longer had to wait to see the results. Though he spoke positively of the changes to photography over the past 10-15 years, he also acknowledged the impact of technology to his business. He said online sales and everyone having a camera phone meant customers became more scarce in recent years. Despite a slowing business in recent years and stock that had become vintage or semi-obsolete, he still sought out the latest products. Above, he inspects a new Nikon camera arrival with a super telephoto lens. Illustrating this point are two photos Joe took from the same camera (above). On the left a wide angle (24mm equivalent) and on the right with a super tele zoom (2000mm equivalent). At 92 years old he still showed excitement for the advances in photographic technology. But more impressive than adapting to new technology in old age was his work ethic and dedication. He lived in the apartment behind the barber shop for most of his life and later left the city for Palos Heights. This meant a 30 minute commute every day, at least 5 days a week. He continued working because he enjoyed it and he enjoyed talking to people. In addition to running a store full time, Joe’s final years were marked by caring for his wife, whom he married while he was in his 70s. He stopped working only after illness prevented it. By all accounts Joseph Herbert led a rich and full life. For 73 years he ran Marquette Photo Supply on the same stretch of 63rd in Chicago Lawn, adapting the business as needed. According to his obituary, the family planned to operate the business under limited hours for a short time. As of now a “temporarily closed” sign hangs in the window, implying a possible reopening. But it seems the days of Marquette Photo Supply are forever behind us. Joe’s passing and the end of Marquette Photo Supply are a historical loss to the city of Chicago. Although the sun has set for Marquette Photo Supply, a visible legacy Joe left behind is the giant neon sign and quirky midcentury modern store building. For a while at least, passersby have a wonderful reminder of another era in photography. John Morris, Thank You, Thank You Well Done story about Uncle Joe. He was a photographers saint. 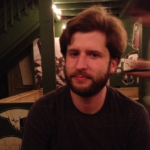 Take it from one former Chicago Sun-Times staff photojournalist. Who loved Uncle Joe. My heart is still broken over his passing. There was No one like him. I can’t even go by the store I would lose it. But I do honor Uncle Joe every time I pick up my Nikon’s to photograph any assignment. Really nice story, rich in detail. My compliments. There is one aspect that needs expansion, though: “He lived in an apartment behind the barber shop for most of his life.” When I was growing up in the 1960s, Joe lived right around the corner from my house in an immaculate blond brick two-flat, at 3356 W. 60th Place in Chicago, that he and/or his family owned. He/they also owned the lot next to the building, and the lot was the last on the block. 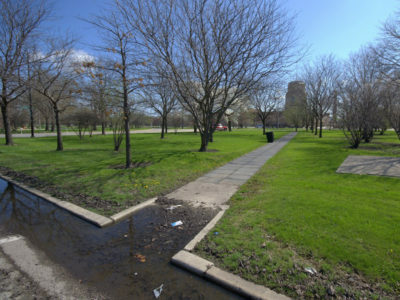 The lawn was the same grass as a putting green on a golf course, quite distinctive, especially in a rather ordinary Southwest Side Chicago working class neighborhood. So, from at least the mid-’60s onward, Joe did NOT live in an apartment behind his brother’s barber shop. Perhaps it was Joe’s brother, Peter the barber himself, that lived most of his life in an apartment behind the barber shop?? Dunno.